An Old World vegetable with Asian origins, eggplant is thought to have been eaten both raw and cooked in China since at least the T'ang dynasty (established the year 618). When raw, eggplant is bitter, tough, and chewy, but when cooked the vegetable turns sweet with a rich, nutty flavor, and tender, even creamy texture. There are a few different eggplant varieties, with the largest being the most common in American supermarkets. Most of these recipes feature Chinese eggplant, a slender, thin-skinned purple variety that has a more delicate flavor than the large globe-shaped eggplants most often found in western supermarkets. One recipe calls for Thai eggplant—these small, golf-ball sized eggplants normally have a greenish-white skin. Japanese eggplant works best in the pan-fried eggplant with miso recipe, but you can substitute Chinese eggplant if needed. The delicate flavor of Asian eggplant goes nicely with the pork, spices, and seasonings in this popular Szechuan eggplant in garlic sauce recipe. Of course, there is plenty of garlic, and the chili garlic sauce brings a bit of heat to the dish. The step-by-step instructions help take some of the challenges out of frying eggplant, which can be tricky since this vegetable is so porous. 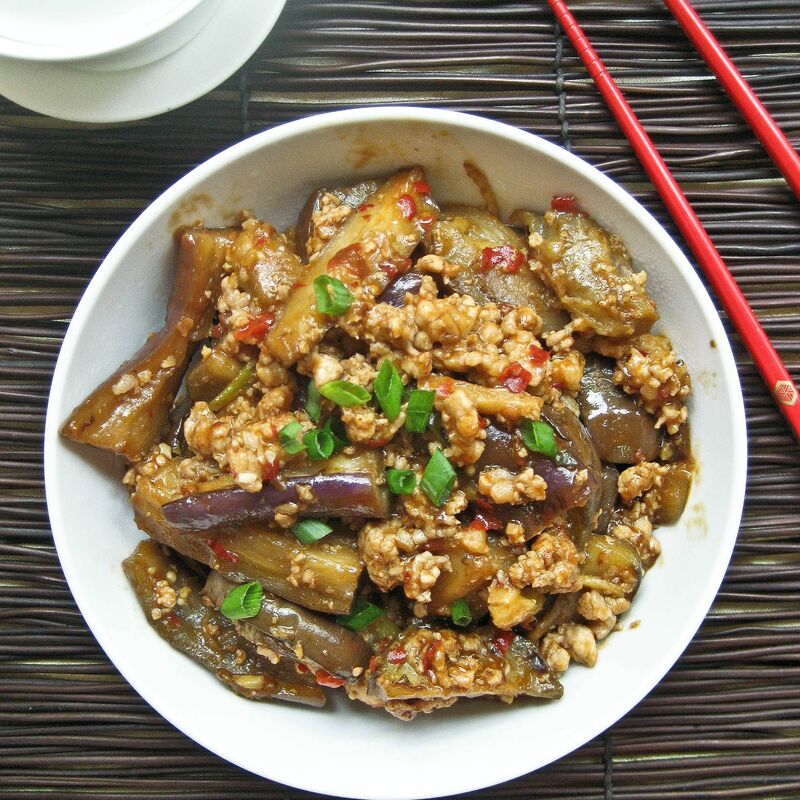 This spicy Szechuan eggplant is a variation of eggplant in garlic sauce (recipe above) using red rice vinegar and hot bean sauce. If you have trouble finding these ingredients, you can substitute red wine vinegar or balsamic vinegar for the red rice vinegar, and replace the hot bean sauce with Tabasco sauce—start small with 1 teaspoon Tabasco and then add more as desired. In this Hakka-style Asian eggplant with mint recipe, the eggplant is cooked twice—first deep-fried to seal in the moisture, and then stir-fried until tender in a sauce that includes oyster sauce, chili garlic sauce, and the distinctive licorice flavor of Thai basil. The finished dish is garnished with mint leaves. This recipe comes from chef and cookbook author Martin Yan. This Korean seasoned eggplant side dish recipe consists of strips of eggplant that are quickly steamed and then tossed with a variety of spices and seasonings, including sesame oil, toasted sesame seeds, soy sauce, and Korean red pepper flakes. The result is a fresh tasting eggplant dish that is tender in texture and beautiful to look at. In this recipe, eggplant is pan-fried and sweetened with miso, the thick paste made from fermented soybeans and barley featured in numerous Japanese dishes. The rich sauce complements the soft texture of the eggplant, and the glaze is easy to prepare. There are three types of miso: white, red, and yellow—most chefs prefer white miso for its lighter flavor and lower sodium content for this pan-fried eggplant with miso recipe. Garlicky and tender, Thai grilled eggplant makes a great side dish or feature recipe on a vegetarian buffet. Chinese or Japanese eggplant is sliced thinly, marinated in a flavorful Thai mixture, and then grilled until soft and golden. You can also use the marinade as a sauce and add it at the end, or serve as a dip for the eggplant.